Planning appropriate lessons - Montessori educators are trained to have extensive knowledge about child development. While most traditional teacher education programs require students to take a course on the topic, development is essentially the foundation of everything we do as Montessori guides. Practiced guides know so much about the behaviors of growing children that seemingly insignificant occurrences signal a transition into a new plane of development. The toddler that has mastered toileting and can be observed spending long amounts of time with practical life activities is making the transition necessary for the primary classroom. A child nearing six that has lost a tooth and seems suddenly very motivated by social interactions with their peers is moving into the second plane of development and will respond well to lessons involving storytelling and deeper information about cultures around the world. The challenge of the guide is to identify the moment when a child is entering a sensitive period; this is their development showing they are ready to learn specific skills that must be taught in a way that honors their growth. Making sure the environment serves the children - While the guide’s role in a child’s education is important, the environment plays an even bigger role. It is the guide’s job to make sure the classroom environment allows children to find what they need, feel inspired to work, fosters independence, and allows for safety and comfort. If, during an observation, it is noted that a piece of furniture disrupts the flow of movement, it will be moved at a later time. If many children prefer to work on the floor, it will be important to note whether there are enough work rugs for them all to use. If no children have used a specific material in a number of weeks, it may need to be reintroduced or removed from the shelf. Each item in the classroom must be placed intentionally and with a specific purpose in mind. If it is no longer serving its intended purpose, reflection and a solution are required. Assessment of skills - The word assess is derived from the Latin form to sit beside. Montessori schools do not determine mastery with the use of tests, but rather by utilizing observation. Instead of giving children a piece of paper with questions on it, we watch them in action. When a child is able to independently place number tiles in random order on a hundred board, we know they have grasped the concept of ordering those numbers. A child who is able to complete complex patterns within the shape they traced using a metal inset, and who also frequently uses the sandpaper letters correctly is likely ready to learn the written formation of letters using a pencil on a piece of paper. This assessment, of course, ties back into planning appropriate lessons, as the guide has concrete information to inform their instruction. Formal observations - A Montessori guide will likely observe in the classroom most days, or multiple guides may take turns observing. These observations typically last between fifteen and thirty minutes, but the amount of time can vary. While each guide has their own preferred method, they typically sit quietly and use a notebook to record what they observe. Children are taught about the importance of this work and they know not to disturb the adult at this time. Sometimes a guide will sit in a specific chair or use a special clipboard to signal to the children that they are working. For new guides, the temptation to intervene can be powerful, but we learn that unless a child is in danger it’s often best to wait it out and see what happens. Most classrooms have a second adult that is able to redirect a child who may be overly disruptive, allowing the observing adult to continue. During this time the guide simply watches and takes lots of notes. It is important that the notes be strictly observational and that any judgement or inferencing be reserved for another time. Informal observations - During the course of the work period, guides will make a great many observations in the moment. While walking across the room to retrieve something, while speaking to a child, or even whilst in the middle of a lesson, there are many helpful bits of information a guide can gather and record that will help make the children’s educational experience the best it can be. As you may imagine, this results in many, many notebooks full of amazing and adorable anecdotes. 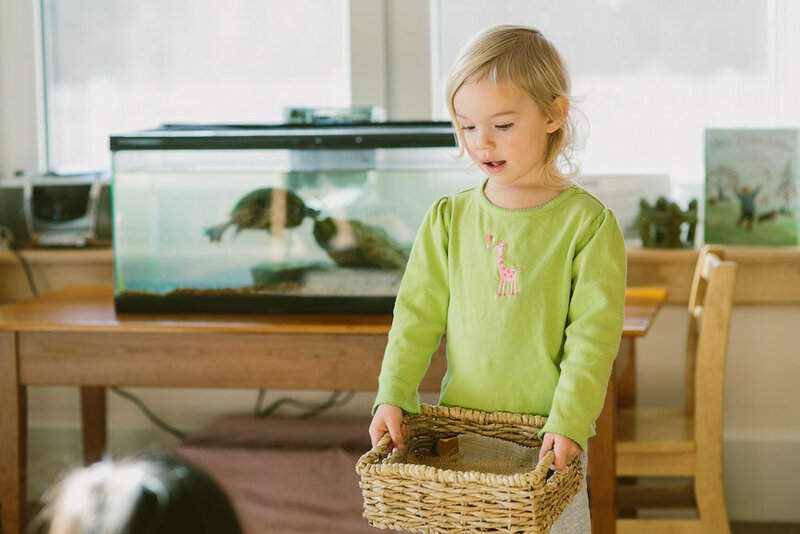 Whether you are considering Montessori for your child, they are in a program but getting ready to move to a new level, or if you’re just curious and want to learn more about the philosophy, observation is one of the greatest tools available to you. 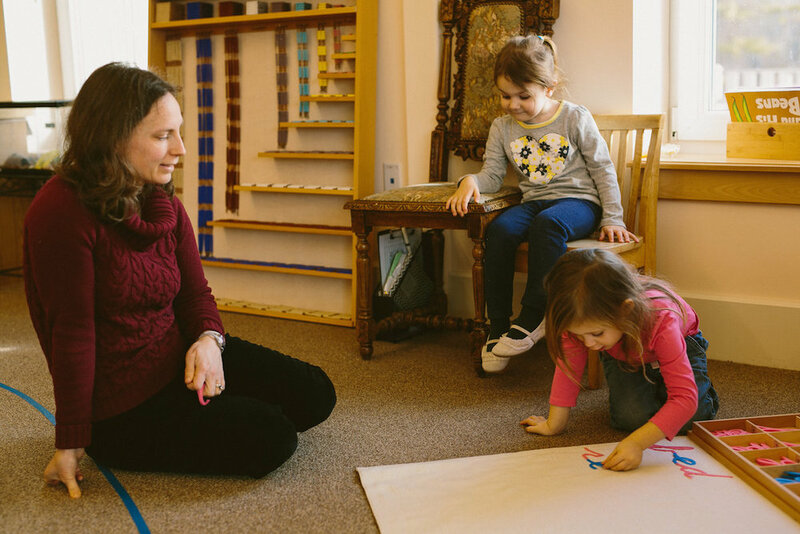 Even the most experienced guides make time to visit other Montessori schools when possible so that they may observe other classrooms and gather fresh ideas and inspiration. We invite you to contact us should you be interested in giving it a try. As you pay attention and observe your child’s play, eating habits, sleeping habits, and social habits, you may learn many new things about their development. This, in turn, will allow you to reflect on how you might best support them on their journey through childhood. Slow down, observe, and enjoy those moments.